Multimedia devices such as mobile phones and tablet PCs must meet consumer demands for high levels of design as well as smaller and thinner sizes depending on the purpose of the device. For this reason, chipmakers who conduct research and development on the semiconductor packages included in such multimedia devices are challenged to meet such needs. Under such circumstances, M Inc., a chipmaker that develops and manufactures semiconductor packages for smart phones and tablet PCs, had been maintaining healthy sales growth. However, the rising price of gold, which is used as a material for the bonding wires in the semiconductor packages, began to squeeze profits. Mr. S, Head of the R&D Division, started searching for a way to more efficiently produce the semiconductor packages while keeping production costs low. Soaring gold prices led M Inc. to review the materials used. However, use of alternative materials posed three hidden challenges. While reviewing the materials used in the current production flow from the viewpoint of reducing costs without downgrading quality, Mr. S focused on gold, which was used as a material in the bonding wires used in the development and manufacturing process of semiconductor packages. He realized that a significant cost reduction would be possible if gold, the price of which has recently been soaring, were to be replaced with another material. Copper bonding wires emerged as a potential alternative to gold. Although copper wires are far less expensive than gold wires, the copper wires evaluated were of questionable quality. 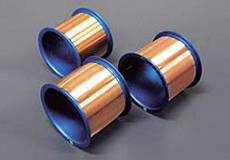 Despite the high performance characteristics noted in their catalogues, M Inc.’s extensive R&D experience lead to many concerns regarding the characteristics of copper, such as that copper wire surfaces tend to be oxidized and thus are less adhesive, as well as that copper wires are likely to cause chips to break during the wire bonding process due to hard melting balls. Successfully reducing costs by sacrificing quality and productivity was the opposite of what M Inc. intended to accomplish. At a loss about how to proceed, Mr. S consulted with a supplier whom he hoped could help him find a solution. A 90% reduction in material costs! What is required of the ideal partner for R&D engineers? Mr. S contacted Tanaka Precious Metals Group, with which his company had business regarding other products. Later, when Mr. S explained his current problems to a Tanaka Precious Metals Group sales representative, the representative introduced Tanaka’s newly developed copper bonding wires. The representative explained: "We have developed this copper bonding wire with the world’s most advanced technology. The features of this wire are different than other products; since the copper has been coated with palladium, the wire has dramatically improved corrosion resistance and adhesiveness." After discussing a number of issues with the Tanaka sales representative, Mr. S strongly felt that Tanaka would not only develop and supply excellent materials but also suggest solutions such as the way such materials could best be used as well as that Tanaka would be the ideal partner for its research and development engineers, which is normally beyond the scope of the relationship between buyer and seller. Mr. S felt this way for the following two reasons. • Since its establishment as Tanaka Denshi Kogyo K.K. in 1961, Tanaka’s engineers have continued to visit their customers even after products and services have been delivered in order to listen to the voices actively involved in development. • Tanaka Precious Metals Group possesses proprietary technologies for palladium coating. After holding several meeting with Tanaka, Mr. S confident that Tanaka could be trusted and would provide effective solutions, concluded that M Inc.’s capital investment would be fully recovered due to low operating costs. He immediately began testing Tanaka’s products and decided to perform a full-scale introduction of the products after taking future developments into account. Successfully cut material costs by 90%! Moreover, the copper wires exceeded the performance of gold wires in terms of both conductivity and durability! As a result, M Inc. adopted Tanaka's cutting-edge copper bonding wires and successfully cut material costs by 90% by replacing the gold wires. 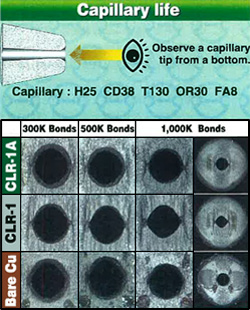 In addition, M Inc. discovered that heat and wear on the capillary tips due to vibration were one reason behind the diminishing quality observed. After consulting with engineers from Tanaka Denshi Kogyo K.K., M. Inc. not only successfully improved the lifespan of the capillaries by 75% while maintaining their quality, they also reduced the labor involved in exchanging capillaries as well as the costs of the capillaries. "Not only did the sales representative-who was originally a knowledgeable engineer he made serious efforts to help us to find solutions by looking at our problems from our perspective from the study phase onward, which gave us a lot of confidence. Moreover, he responded to all manner of questions and inquiries even after we introduced the product, so we trusted him 100% regarding the materials," said Mr. S.
Since then, members of Tanaka Precious Metals Group staff have been regularly exchanging opinions with M Inc. in order not only to maintain their relationship with the client but also as part of efforts to supply even higher quality copper bonding wires.